Merry and Pippin flee into Fangorn Forest when the Uruk-hai Camp is attacked by a patrol of Rohirrim led by Éomer. Just as they are about to be caught by an Orc, Treebeard saves them. Treebeard then calls an Entmoot (Meeting) to discuss the news that they have brought. Meanwhile, Aragorn, Gimli and Legolas follow Merry and Pippin's trail into Fangorn Forest where they find Gandalf alive. After the Entmoot, Treebeard tells Merry and Pippin that the Ents have chosen to do nothing to help against Saruman. 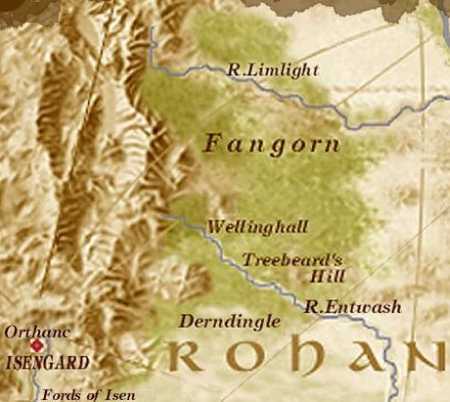 Pippin asks him to take them South where Treebeard discovers that Saruman's Orcs have been cutting down the Forest. The Ents then decide to attack Isengard.